In this tutorial I’ll show you how to combine Zeit’s Now, a modern cloud platform, with the best developer services — managed via. Manifold to quickly get a Node application up and running. To build even an average modern application, a developer is forced to face a mountain of decisions: will the application consist of many micro-services or be a monolith, which cloud will it live in, how will you deploy it, which data-store will you use? Oh, the choices! Services like Mailgun, Auth0, MemCachier and Scout, allow us to borrow expertise and short-circuit development. But, each of these services require you to create an account, add your credit card and juggle credentials and dashboards, which still beats implementing this functionality yourself. Not bad, but let me introduce you to a new process, that (dare I say) is 10x faster and as a developer, I know you need all the time that you can get! 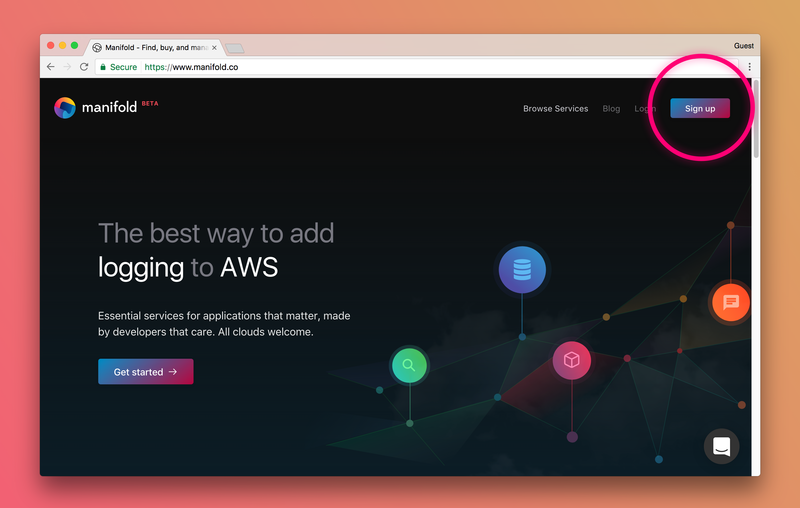 Manifold is a new platform that is making it easy and secure for developers to discover and manage cloud services. 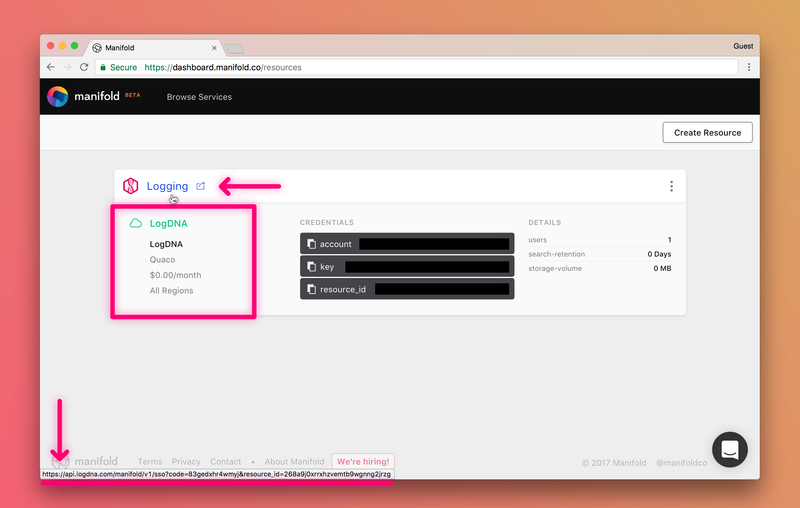 Manifold brings all of your logging, email, databases, and search services together in a central dashboard. 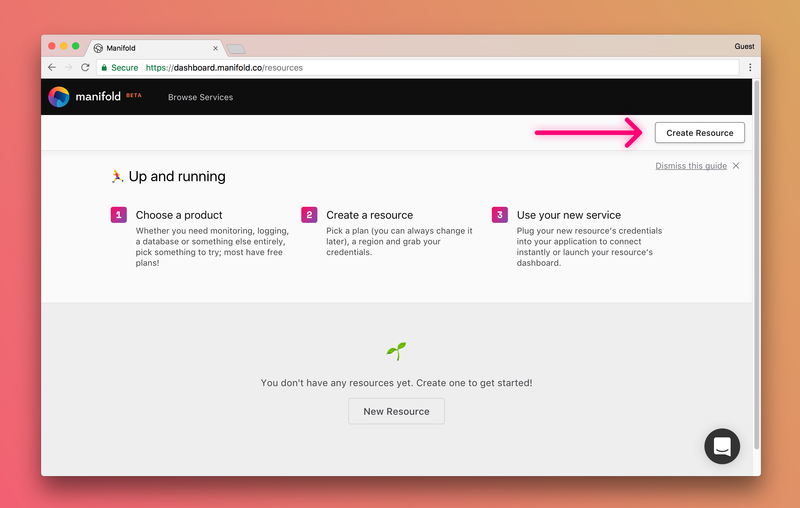 Find — the monitoring, logging, databases, etc services that your application needs to grow. Manage — Upgrade, downgrade and cancel services anytime you want with the click of a button. Enough about Manifold. Let’s build our app and discover for ourselves. Our time starts now! 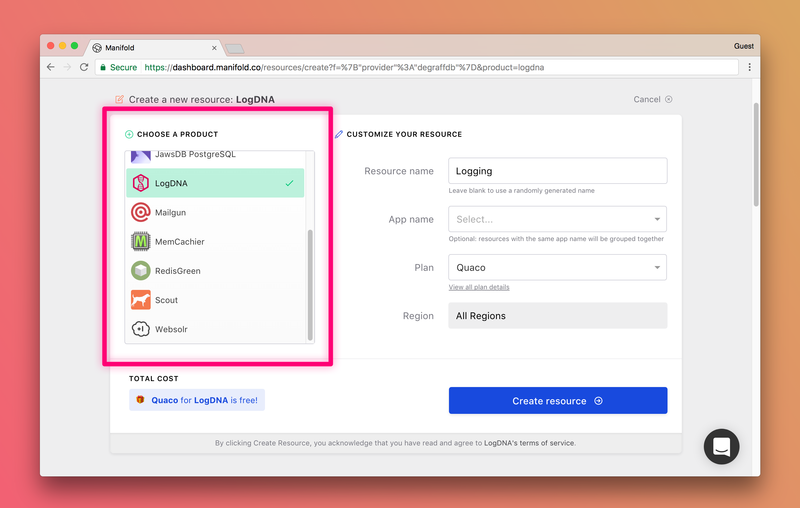 Test Logger — Our app is so simple, it has only one feature: logging! The importance of logging in an application can not be overemphasized. 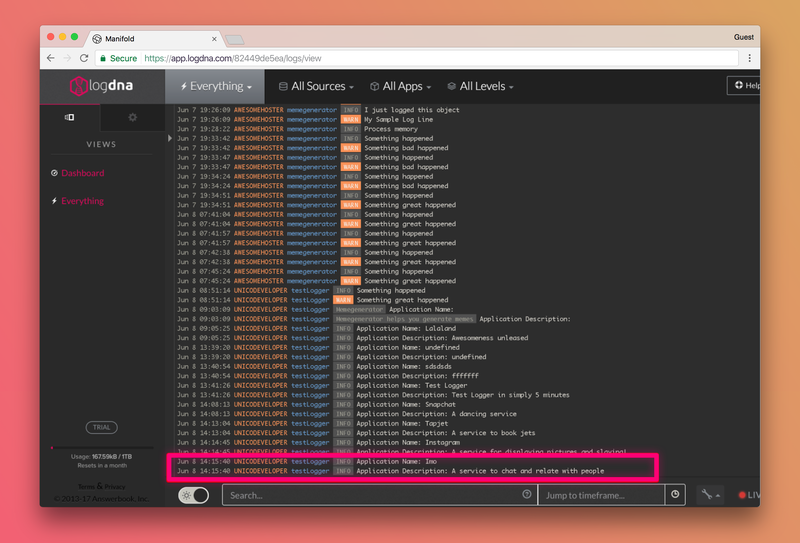 You need to be able to track everything that goes on in your app. When something goes wrong in an app, the log repository/dashboard is the first place that is checked. Once you are logged in, you’ll have access to a create resource button on the right hand side. The list of available resources are highlighted in the Choose a Product section on the left. You can go ahead and click on the service you want to use. For our app, we’ll take advantage of the LogDNA service. Now, go ahead and click on the create resource button to provision a new LogDNA account from within manifold dashboard. Sweet! Within the Manifold dashboard, we have our login credentials for LogDNA, the monthly plan, and other details for the service. Clicking on the resource name takes you to the LogDNA dashboard. We’ll write the backend with node.js. 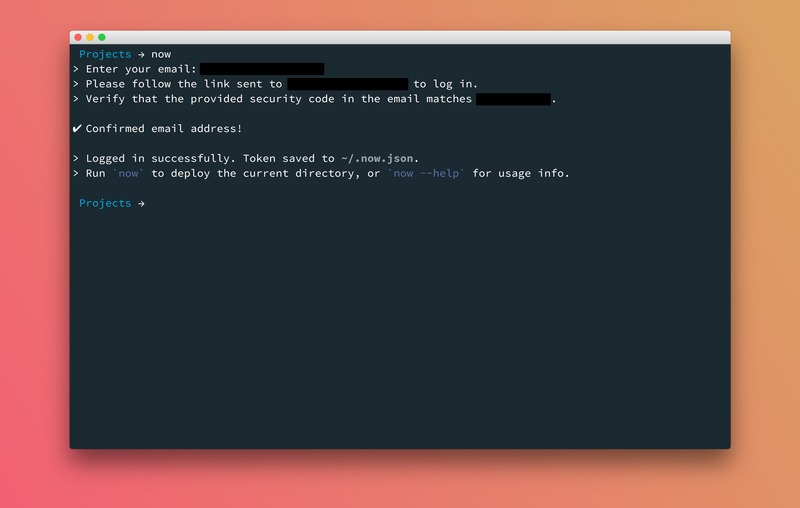 First, create a package.json file with npm init command. Create a server.js file and dump the following code in it. In the code above, we spun an express server and installed the logdna node module. In the options object, go ahead and replace the values with yours. Make sure you have a .env file that has a key variable with the value of your LogDNA key. You’ll find this in your Manifold dashboard too, just click reveal credentials. The code below sets the logger up with the credentials. 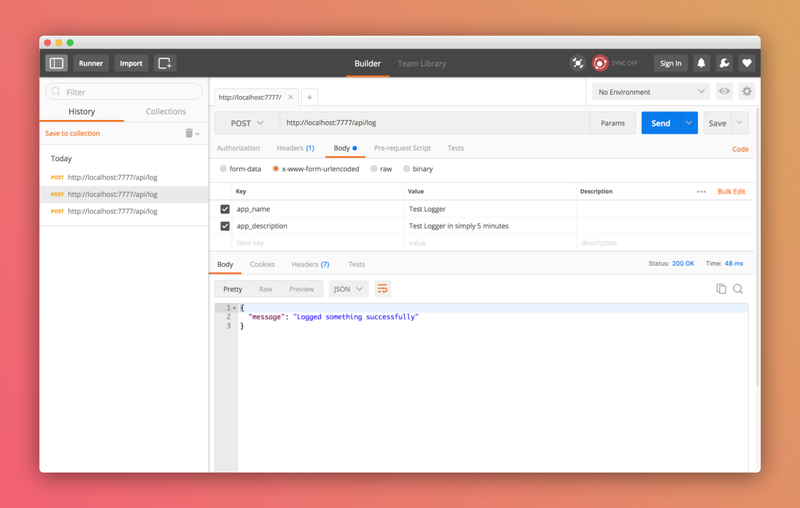 Now, run the node.js backend with node server.js and try out the /api/log endpoint with Postman. Switch to the LogDNA dashboard to see the result of this operation. Let’s take it a step further. We’ll build a simple frontend interface using React. The code for the backend can be found here. 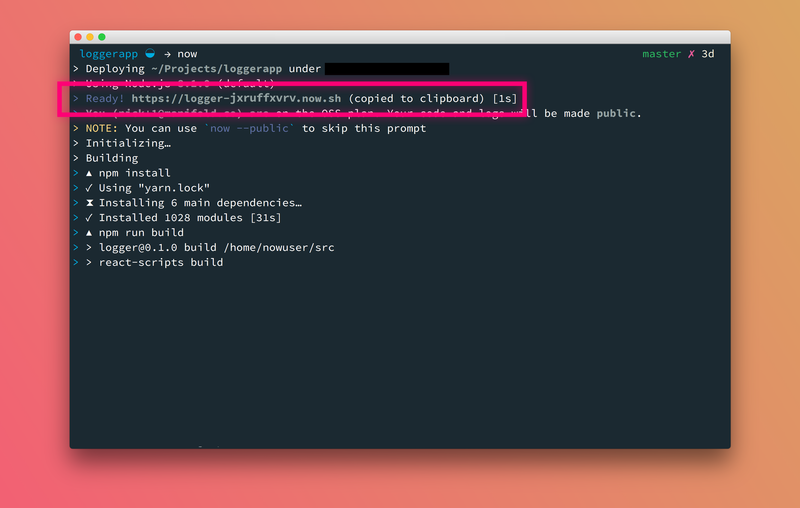 The highlighted url is https://loggerapp-jxruffzvrv.now.sh. So, we’ll use this URL in our frontend. We’ll take advantage of the valuable create-react-app tool by Facebook to quickly scaffold a new React application. Finally, go ahead and run your app. Save the data and log it out? No problem! We can easily spin up the **MemCachier or [JawsDB MySQL](https://www.manifold.co/services/jawsdb-mysql)** service on the Manifold dashboard to store data sent by the form by repeating the same process in less than a minute! With the help of LogDNA & Manifold, we have been able to spin up a test Logger app in less than 5 minutes. Furthermore, the ability to add more services in less than a minute is within reach via our central dashboard. Hopefully this will inspire you to try out Manifold — The Service of Services and 10x your productivity in development and app deployment. You can find the source code for this tutorial on Github.